Driven by the prevalence of respiratory diseases, especially chronic obstructive pulmonary disease (COPD), the number of inhalation formulations for nasal and pulmonary drug delivery continues to grow. 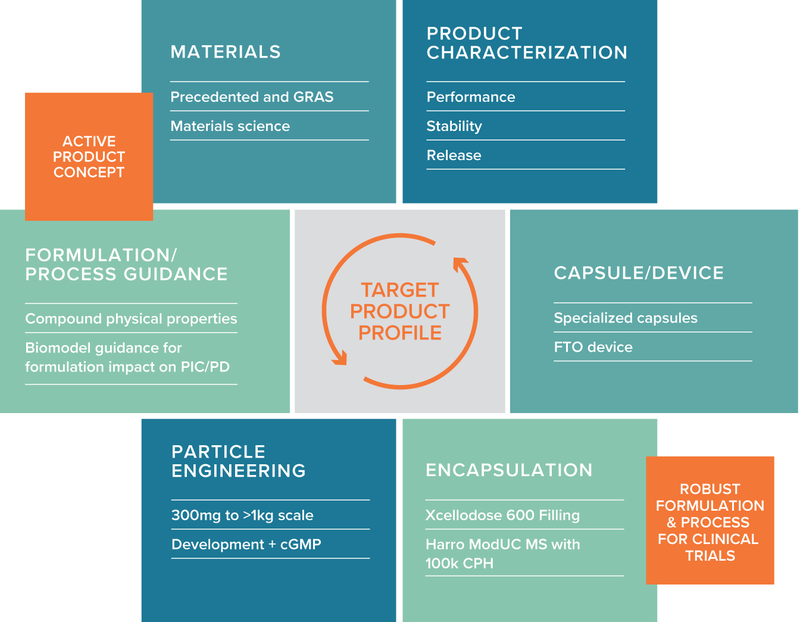 Capsugel offers an inhalation drug-delivery approach based on proven particle engineering through spray-drying technology and specialized encapsulation technology, as well as specially designed capsules for use with dry-powder inhalation (DPI) devices. Additionally, specialized DPI capsules have been developed which specialized encapsulation technology, as well as specially designed capsules for use with dry-powder inhalation (DPI) devices. Building on particle engineering expertise to optimize pulmonary drug delivery, Capsugel brings advanced inhalation therapeutics to market through our unique combination of science, engineering, and formulation experience. The lung provides an attractive drug absorption target for both local and systemic disease states and is increasingly utilized for the delivery of both small molecules and biotherapeutics. Dry powder inhalers (DPIs) are often a preferred drug delivery platform due to their inherent formulation flexibility and patient convenience. Our core particle engineering expertise is complemented with extensive formulation and process development, specialized CMC/analytical, and encapsulation capabilities to provide integrated DPI product development from concept through the clinic and commercialization. Our industry-leading expertise in the production of engineered particles for inhalation formulations is based on spray-drying technology. Spray-dried engineered particles have been shown to offer substantial advantages over lactose blends which contain micronized drug and a lactose carrier used for nasal and pulmonary drug delivery) and use with DPI devices. Capsugel offer a full range of services, from proof of concept and formulation identification to powder manufacture and encapsulation for clinical studies, current Good Manufacturing Practice (cGMP) manufacturing. With over 20 years’ experience and billions of capsules delivered for inhalation drug- delivery systems, Capsugel is well known for its world-class quality that helps ensure dose uniformity and reproducibility, as well as high-performance machinability. Our dry-powder inhalation (DPI) technology offers an invaluable drug-development opportunity for respiratory or systemic drug delivery. Two-piece capsules are excellent containers to hold powder formulations for DPI administration. By treating the capsule as a formulation excipient, formulators can take advantage of the properties of various polymers to enhance and protect the formulation inside the capsule. Similarly, understanding those properties can further minimize interaction between the capsule and the DPI device. Having formulated more than a thousand compounds, our scientists have encountered a myriad of API characteristics and delivery challenges. This has enabled Capsugel to optimize its formulation selection methodologies based on modeling, and optimize our process development and scale-up approaches. A comprehensive analytical platform with specialized CMC expertise is in place to support all aspects of inhalable product development. Interested in learning more about Inhalation Technology? Learn more about how Capsugel’s Inhalation Drug Delivery solutions can improve your nasal, pulmonary and DPI development programs.